Easy one pot meal, ready in 20 min. This “Clean Eating” version of African Peanut Soup is healthy and hearty. Creamy peanut butter, warming spices (like cumin and coriander) and superfoods sweet potato, tomatoes and Swiss chard (or kale) will warm you up and keep you full on a chilly fall/winter day. Vegetarian or add chicken for additional protein. 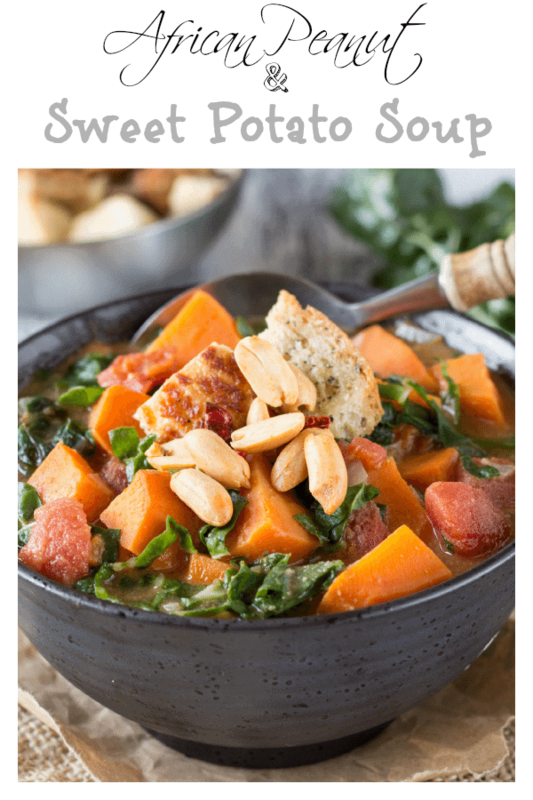 African Peanut and Sweet Potato soup…the perfect antidote to chilly winter days! This hearty and vegetarian recipe for African Peanut Soup has become one of my favorites! I like to make a big batch on the weekends and have a healthy go-to option for weekday lunches. It also makes a great snack. Just heat up a cup of soup (approx. 100 cal. for 1 cup) and you’ve got a nutritious snack. Filling…so you’ll be less tempted to dive head first into that plate of holiday cookies. Heat olive oil in a large sauce pan or Dutch oven over medium-high heat. Add garlic, onion and ginger and stir frequently until the onions are softened (approx. 3 min.). Add Swiss chard and continue simmering until chard has wilted (approx. 2 min.) Serve soup and garnish with whole-grain croutons if desired. This soup is delicious!! I just made it and I’m sitting here eating it. Thanks April! I’m glad you enjoyed it! Would this soup freeze well? Hi Tricia…yes you can absolutely freeze this..no problem! I have made this twice now. I doubled the spices, the sweet potatoes and added two cans of precooked chick peas. For me, it wasn`t flavourful enough without the extra spices. The chick peas are for extra protein. Hi Tricia…great idea to add some additional chickpeas for extra protein. And, yes..because you are adding extra sweet potatoes and chickpeas it will definitely need more spices. That’s the beauty of this soup…it’s very adaptable! I have made this soup repeatedly and it is excellent! Delicious! I usually don’t use all the tomatoes that the recipe calls for. Rather I simply use a regular 14 oz. can. It’s perfect to me this way. Thanks Kesha!! so happy you like it! and much appreciate you taking the time to comment. Can you make it in the slow cooker. Hi Arlene…I don’t see why you couldn’t make this in the slow cooker. I’d probably hold off adding the peanut butter and the swiss chard (or kale) until the last 30-60 mins. of cooking. Would love to hear how it comes out! How many hours on slow should I make it and how many hours on high should make it. Can make on low 8 hours? I think it would be fine to cook on low for 8 hours, but I would make sure to add the peanut butter and swiss chard/kale in the last hour of cooking. I dont think either would do well cooking for that long a period of time. Can I put chicken in there too. Hi Arlene..sure, you could add chicken no problem. Either skinless chicken breasts or thighs would work. You could place them in whole( and shred with two forks prior to serving) or use skinless/boneless and cut up into pieces to put in the crockpot. 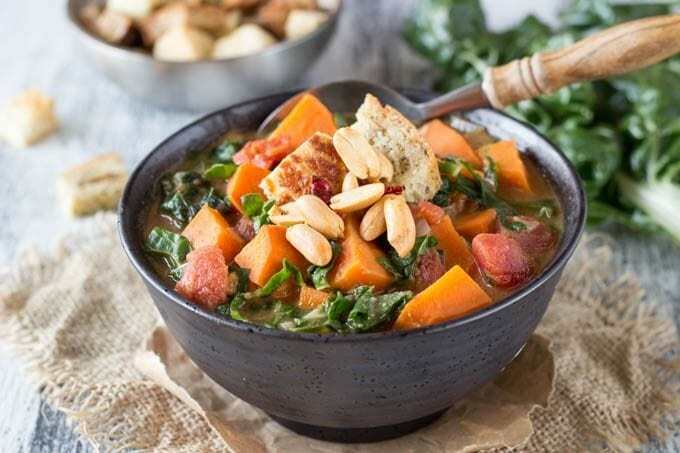 This soup looks incredibly healthy and delicious – definitely a recipe I need to try!